CNS Canada — As barley prices climb, feedlots around Lethbridge have found a cheaper feed option: corn from the U.S.
“Price has (pushed feedlots to buy corn). Barley, it’s probably $4, $5 a tonne higher than corn price right now. And the cattle feeder can source corn quite easily and more economically than barley,” said Allan Pirness of Market Place Commodities in Lethbridge. Producers also aren’t as interested in selling their barley for feed. According to Pirness, it seems they are getting prices from grain companies who are exporting barley. The grain year just started in August but as of Aug. 26, according to the Canadian Grain Commission, 64,100 tonnes of barley have been exported. This marks a lower level than last year at this time, when 184,700 tonnes had been exported. Corn prices from the U.S. are lower due to large stockpiles. 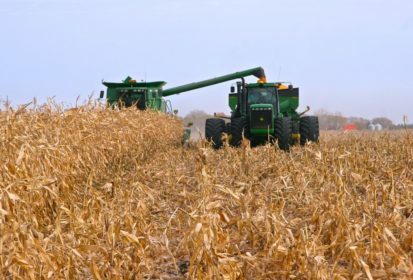 According to the U.S. Department of Agriculture, corn stocks in the U.S. as of June 1 were at 5.31 billion bushels, up one per cent from the previous year. Cash bids for feed barley for producers are currently at $248 per tonne, while corn is at $247 per tonne, according to Pirness. Given feed barley’s current price, Pirness doesn’t think it will hold there long and is recommending producers should consider selling. “We’re seeing OK crops; they’re not huge crops but they’re OK,” he said. Not a lot of wheat is making its way into feed market as it’s too expensive, Pirness said. Producers are getting better prices from the grain companies, as the quality of the crop is good.